Everywhere you turn this summer is talk about black crime. More than mere talk, pushing propaganda to support laws like Stop and Frisk and Stand Your Ground mean that real rights are at stake for millions of Americans. With so much chatter about black crime and urban crime, you might be surprised to find out that the vast majority of crimes in the US are committed by whites--nearly 70 %— which makes sense when you think that the majority of the US population is White. We all want to be safe, so who’s to blame: is crime a white problem, a black problem or something else entirely? This week a federal court struck down NYC’s Stop and Frisk policy, citing racially discriminatory enforcement. The policy’s defenders are crying foul, and are warning an explosion of crime will happen when the people’s fourth amendment rights are respected. 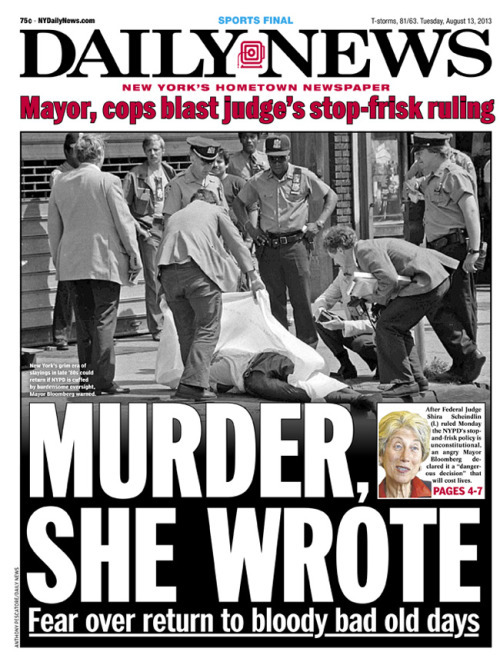 It’s true crime in New York is at historic lows. Before you stop and rest on your laurels, crime is down to historic lows not just New York City, but around the country, including many cities that do not have a stop and frisk policy in place, so attributing the drop to Stop and Frisk is misplacing whatever “credit” there is. For decades scientists, sociologists, psychologists and politicians have tried to nail down that combination of factors that result in peaceful communities with no crime. But the causes of crime are many, a complicated mash up of environment and systems, politics and people. There is one thing the scientists do agree on: what does not cause crime is a secret gene carried only by black and brown people. Between Stop and Frisk and the Zimmerman travesty trial earlier this summer, there’s lots of focus in the news on the connection between blacks and crime. While no mention of race was allowed into the Zimmerman trial, defense attorneys argued that Trayvon Martin was perceived as a threat by their client. The unspoken reason he was viewed as a threat was that he was young, black and hooded. Because he fought his stalker and did not live to tell the tale he is painted as a brute who got what he deserved. Back in New York, 88% of those people stopped and frisked were found to be unarmed, and innocent of any crime. Between the two cases we literally have hundreds of thousands of African Americans who have been deprived of their constitutional rights, including their right to life in the case of Trayvon Martin. That their rights have been trampled not by feet but by laws is the very definition of racism. Despite, and perhaps because of, the exposure of institutional racism in our justice system, a flock of “experts” have taken to the airwaves to assure us of the link between blacks and crime that justify these discriminatory legal practices. News programs spend an enormous amount of time scaring us out of our wits with twisted stats, while scripted shows keep playing on age old stereotypes of a dark and terrifying other crawling through our windows at night. These stereotypes offer easy boogymen to blame but fail to reflect reality. The all too sad truth of violent crime is that the majority of violent offenders are known to their victims, most often share the same race, and sadly sometimes share a home.Painted large in American media is the hooded thug, tattooed, pants sagging, middle finger to the world he is marked by his trappings of blackness as a threat to society. He slinks through rap videos into the evening news. From video games to scripted dramas, blacks are over represented as criminals in American media. Before you cry Breaking Bad on me, consider that not only are blacks more often represented as criminal offenders, when they are they are rarely given the depth of examination afforded a Heisenberg or Tony Soprano. Besides, when was the last time that a week of shooting sprees by white men has spurred a Fox debate on the White on White crime problem? White criminal are often represented as having some underlying reason for their crimes. By contrast, the black thug in news is cruel for the sake of it, killing his own boys ruthlessly while in scripted shows he kills for sport, stalking his white prey through sound stages full of darkened streets. Just as decades of super thin models have warped our perception of the normal sized female body, so have the misrepresentations of black men manipulated public perception of the black man. Constant characterization of blacks as thugs and gangsters leave the average media viewers with the perception that all black men are violent and out of control. Repetitive imagry showing blacks as thugs draws a false connection between race and crime. Add that to the number of whites reporting that they have friends of color--nearly half of whites according to one recent survey–and this leaves many white viewers without the real world reference that they need to have an informed perspective on their African American counterparts.What’s missing from the flashy crime labs and mean streets of TV crime drama are the many systemic and environmental factors that influence crime and the criminals that commit them. There are many theories on what causes crimes as cities where they are committed, but one thing that rises to the top of the studies is the importance of social economic and environmental factors guiding communities. In fact, research has shown that similarly situated urban environments of whites and blacks would likely result in similar rates of victimization and offense. Factors driving the health of the community like family structure, employment and educational opportunities are the same factors that seem to govern crime. Movie, television and news depict streets full of heartless black thugs, creating an unfair and unwarranted connection between race and crime. When we create a false perception that race and crime are linked, we not only make villains out of millions of innocent americans, we also hide the real factors that make our communities–all communities–unsafe. As viewers we have to take responsibility for educating ourselves about the world we really live in, and untangle media stereotypes from the diverse array of black men that roam the earth among us. Rather than supporting policies to continue discriminatory police enforcement, its time to take a real look at what we can do to make our world safer.